This description of the Book of Isaiah is from Easton's Bible Dictionary. the second half of Hezekiah's reign (Isaiah 36:1 - 66:24). Thus, counting from the fourth year before Uzziah's death (B.C. 762) to the last year of Hezekiah (B.C. 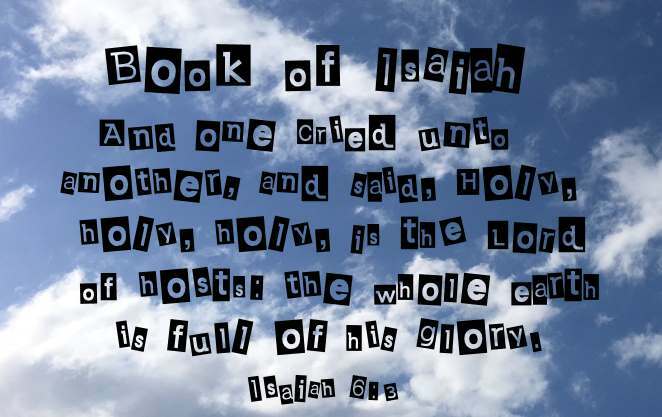 698), Isaiah's ministry extended over a period of sixty-four years. He may, however, have survived Hezekiah, and may have perished in the way indicated above. Four chapters are historical (Isaiah 36:1 - 39:8), relating to the times of Hezekiah. Prophetical (Isaiah 40:1 - 66:24), Israel's enemy Babylon, describing the Messiah as a suffering victim, meek and lowly. That there is such a difference between the style and language of the closing section (Isaiah 40:1 - 66:24) and those of the preceding chapters as to necessitate a different authorship, and lead to the conclusion that there were at least two Isaiahs. But even granting the fact of a great diversity of style and language, this will not necessitate the conclusion attempted to be drawn from it. The diversity of subjects treated of and the peculiarities of the prophet's position at the time the prophecies were uttered will sufficiently account for this. The arguments in favour of the unity of the book are quite conclusive. When the LXX. version was made (about B.C. 250) the entire contents of the book were ascribed to Isaiah, the son of Amoz. It is not called in question, moreover, that in the time of our Lord the book existed in the form in which we now have it. Many prophecies in the disputed portions are quoted in the New Testament as the words of Isaiah (Matthew 3:3, Luke 3:4-6, 4:16-41, John 12:38, Acts 8:28, Romans 10:16-21). Universal and persistent tradition has ascribed the whole book to one author. Besides this, the internal evidence, the similarity in the language and style, in the thoughts and images and rhetorical ornaments, all points to the same conclusion; and its local colouring and allusions show that it is obviously of Palestinian origin. The theory therefore of a double authorship of the book, much less of a manifold authorship, cannot be maintained. The book, with all the diversity of its contents, is one, and is, we believe, the production of the great prophet whose name it bears."